Situated on the side of a hill, somewhere between Cloudland and Miegunyah, is this lovely home originally known as Cintra, pictured above in 2009. It was constructed in 1863 at Bowen Hills for a George Webb and the Georgian influence in the design came from architect Benjamin Backhouse. Here is a current photograph. In 1877, Cintra was purchased by Mr BD Morehead, who was to become Premier of Queensland in the years 1888-1890. Here is a picture of the house from around 1882 - it is situated on the top LHS of the image. Morehead extended the building considerably during the 1880s, including adding the dual verandahs that were not present when this photo was taken. Subsequent to Morehead's death, Cintra was owned by businessman Acheson Overend until 1925, when the large property was divided into two separate holdings. After some alterations, the southern property (not shown here) became a nursing home, and the northern residence became a convent attached to Our Lady of Victories Catholic Church. 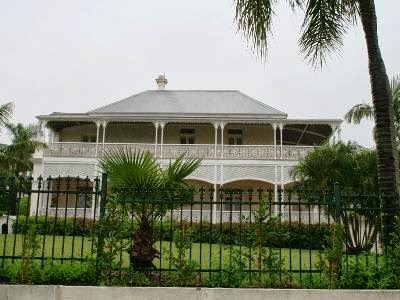 In 1973, that property was released by the church; it was bought and restored by Queensland developer Noel Kratzmann. Subsequently it became an art gallery, Cintra House Galleries. In 1987 the property was sold, and has once again become a private residence.